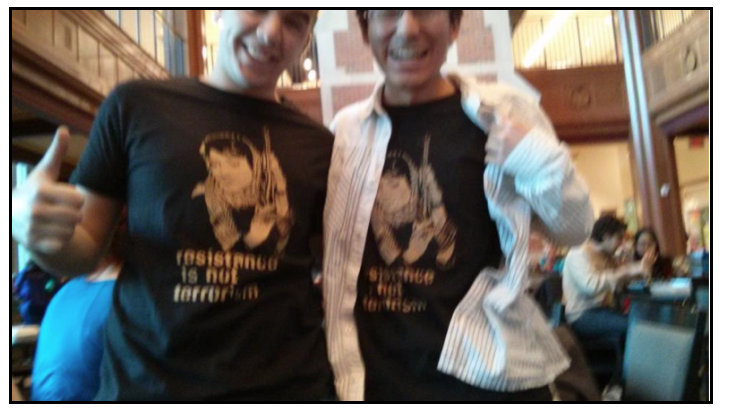 The Tower Magazine is reporting that two members of J Street U’s Washington University chapter donned T-shirts celebrating convicted PFLP terrorist Leila Khaled at a J Street U sponsored campus event last year. On August 29, 1969, Khaled was part of a team that hijacked TWA Flight 840 on its way from Rome to Athens. The T-shirts were emblazoned with an image of Khaled clutching an AK47 machine gun and the words “Resistance is Not Terrorism”. In full damage control mode, J Street U tried to distance themselves from their controversial campus leaders, issuing a frantic, yet muddled press release. The statement referenced a Facebook posting by Washington U student Taka Hiro, denying direct affiliation with J Street U. The implication being that the students wearing the T-shirts are not directly affiliated with J Street U. 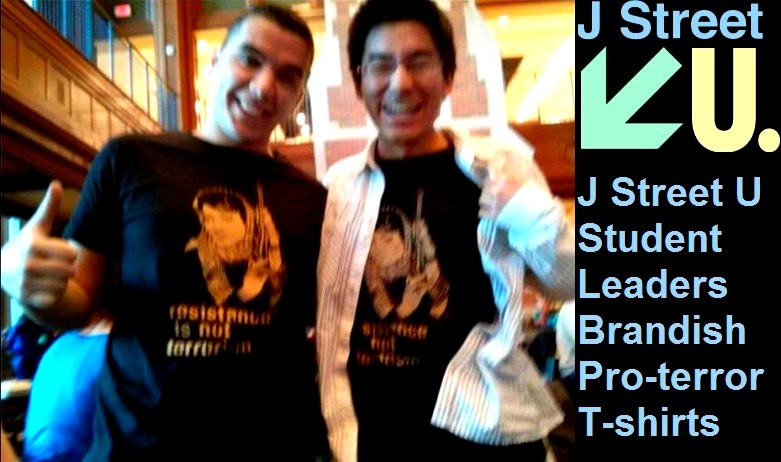 In fact the one student referenced by J Street U, Taka Hiro is not one of the two J Street leaders who were photographed wearing the inciteful T-Shirts, why he was trotted out as exculpatory evidence for J Street U is a mystery. Whatever their point, there is no denying, not even by J Street, that two students advocating violence against citizens of the Jewish State actively participated, promoted and led a J Street U co-sponsored event. In addition, Fadi AbuNe’meh and Taka Yamaguchi appeared perfectly comfortable brandishing terror-icon attire in that forum and none of the J Street U participants or leaders present expressed public discomfort with the obscene display until photos of the two were exposed this past week. Terror afficianado Taka Yamaguchi acknowledges his J Street affiliation. While J-Street broadcasts a sanitized version of their true essence for an all too eager to believe Jewish establishment, their true mission, the undermining of the Jewish state is laid bare for all with eyes willing to see. More photos and details at The Tower Magazine and Truth Revolt. How cool & brave they are! Oh wait, they are dumb as mud! I agree absolutely. You are correct that by closing sessions you can prevent dissent. Prevent dissent? These punks were not “dissenters” they were leading the activity! And look at the pot calling the kettle black. J Street has categorically refused to allow speakers who oppose J Street’s policies on Iran and other security matters, to speak to its members at its conventions. In contrast J Street invites BDS supporters and those who oppose Israel’s right to exist as the nation-state of the Jewish people to speak at its events. J Street only wants people to hear views to the anti-Israel hard left of its position. It categorically refuses to allow its members to hear views that are more centrist and more pro-Israel. @beyondZS – Please do tell, what is the truth? Our article links to the J Street apologia which fails to address the issues reported in the story. J Street creates an atmosphere that welcomes if not encourages such behavior and when exposed issues a feeble disclaimer. We’re not buying it. Would these two thugs be found at an AIPAC or StandWithUs sponsored event? Nuff said. Reblogged this on The Body Of Truth.